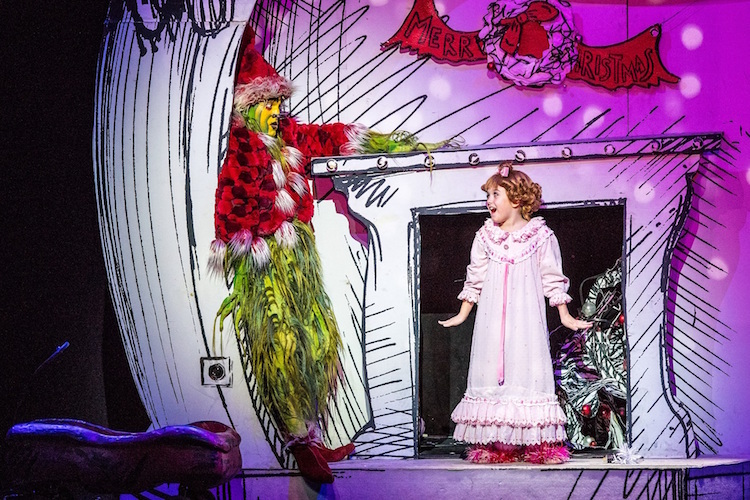 Philip Bryan as The Grinch and the 2016 company of Dr. Seuss’ How the Grinch Stole Christmas! The Musical. What’s green and grumpy and very greedy and determined to squash your Christmas spirit? He was ranked the fifth greatest “Cartoon Character of All Time” by “TV Guide” and spawned a hit film starring Jim Carrey. Whether you love or hate (or both!) the iconic character created by Dr. Seuss in 1957, you’re not going to want to miss The Grinch when he comes to life live on stage. Go beyond the bedtime story to relive all of the holiday magic of Dr. Seuss’ classic tale set in Whoville. Sing along with little Cindy Lou and all of the Whos to beloved songs like “You’re A Mean One, Mr. Grinch” and “Welcome Christmas” and follow the show’s always adorable narrator, Max the Dog. Broadway’s number one holiday hit, the vibrant production features music and lyrics by Mel Marvin and Timothy Mason. Helping to create the vibrant holiday ambience are sets by John Lee Beatty, costumes by Robert Morgan and choreography by Bob Richard. Cheering on the furry Grinch as he discovers the true meaning of Christmas is sure to warm the hearts of kids and adults alike.